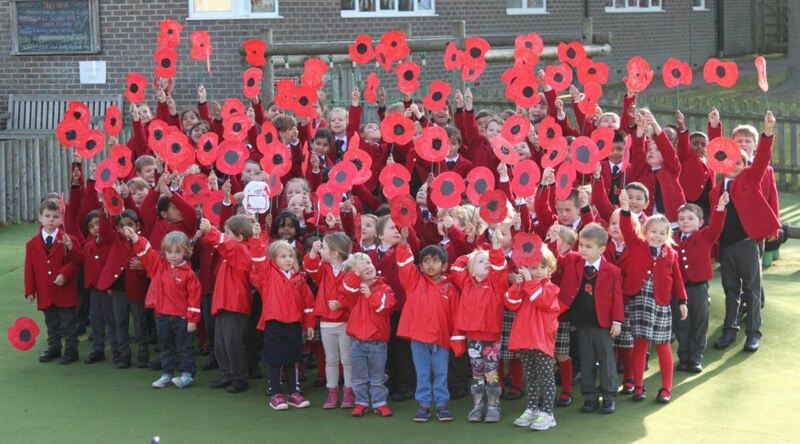 Pre-Prep & Nursery children waving their poppies as part of the school’s Remembrance Day commemorations. All pupils observed the 2 minutes silence standing quietly under the school chapel tower, which is an official War Memorial, and listened to trumpeter Zevon R play ‘The Last Post’ and ‘Reveille’ from the top of the tower. Headmaster Chris Jones commented on ‘how proud he was of the respect and understanding shown by the children, from Nursery to Year 8’. Martin Forde, a local representative from the British Legion, led a chapel service beforehand at which the Year 8 children read out the names of Old Copthornians who had lost their lives in the First World War.